A Northamptonshire orchestra is searching for bass players, cello, viola and general percussionists to join their 50-strong members. Chair and first violin, Maggie Scott joined the orchestra about 15 years ago. She said: "I am so pleased to have the opportunity of playing music with other musicians. Roade Community Orchestra is so important to me for this reason and I would like other musicians to have the same opportunity as myself. There is nothing like being able to take part with a group of musicians all playing different instruments, different sounds, some playing loudly while others play quietly and yet all these sounds produce a wonderful piece of music. Roade Community Orchestra gives the opportunity for all ages and abilities to join together and we are particularly lucky to have such an enthusiastic, experienced and competent MD and conductor who keeps us all on track. Roade Community Orchestra is such a vibrant orchestra." When Maggie joined many of the members were then school children and the atmosphere, she says, has always been enthusiastic. "For me and many members it’s the highlight of our week," she added. "We have a natural loss of members. The younger members go on to do wonderful things at university, some members have left to live abroad and sadly we have lost one or two members due to illness. However, being an upbeat group of musicians we are always looking for new members to join us so we can continue to play wonderful music together." 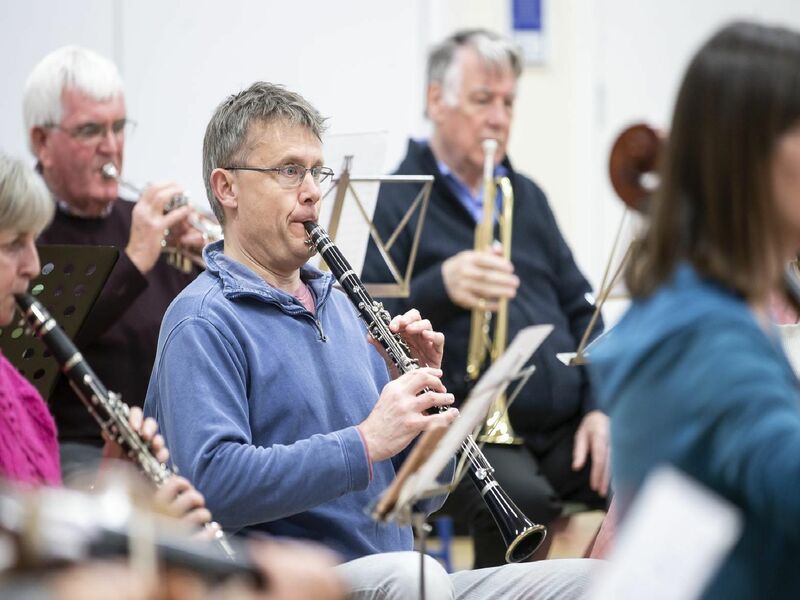 Many of their members travel from all over the county but the orchestra feels there are many musicians throughout Northamptonshire who are not aware of their existence and want to particularly reach out to bass players, cellists, viola plays and general percussionists. Roade Community Orchestra meet every Tuesday evening at 6.30pm to 8.15pm during term time in the hall at Roade Primary School in Hartwell Road. The orchestra consists of all ages, abilities and orchestral instruments and no audition is required. Pictures by Kirsty Edmonds. Musicians play a wide variety of different music including classical, film themes, jazz and popular music. Pictures by Kirsty Edmonds. Anyone who has not played for a while is invited to dust down their instruments and restart. Pictures by Kirsty Edmonds. Felicity Harrison, first violin, learned how to play the violin in her sixties and is now one of the longest standing members. 'Pictures by Kirsty Edmonds.